Synopsis: In 20th-century colonial Kenya, a Danish baroness/plantation owner has a passionate love affair with a free-spirited big-game hunter. Did You Know? Meryl Streep was very nervous during the hair-washing scene, because it was shot near some very territorial hippopotamuses. Quotables: KAREN: Perhaps he knew, as I did not that, that the earth was made round so that we would not see too far down the road. This is a very beautiful film from a cinematographic perspective. The shots of Africa are stunning and, as usual, Meryl Streep is perfection. The only problem that we face with this movie is the same problem that we have with many films about colonialism: it romanticises it. It would be one thing if it was simply a romance that happened to be in a colonial setting; but it’s a different thing entirely when the film portrays the servant, gladly serving their stern yet friendly master. And that’s what happens here. 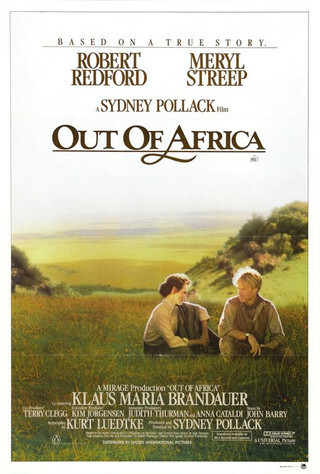 Of course, I don’t pretend to know the relationship that Karen Blixen had with her servants, but these films all too often portray the white colonials as heroes to the “savages”.